Yesterday was Guru Purnima a day to pay homage to our gurus. Guru comes from the sanskrit Upanishad describes the syllables gu as ‘darkness’ and ru as ‘destroyer’. Therefore a Guru is more than a teacher but the ‘destroyer of darkness who brings the light of knowledge. In the yogic tradition, the day is celebrated as the occasion when Shiva became the first guru, as he began the transmission of yoga to the Saptarishis. The Guru Purnima on this full moon symbolizes the deeply respectful relationship between guru and disciple. This day marks the first peak of the lunar cycle after the peak of the solar cycle. Guru Purnima is held sacred in the yogic tradition because the Adiyogi (Lord Shiva, the ‘first Guru’) opened up the possibility for a human being to evolve consciously. This auspicious day is also held dear in Hinduism, Buddhism and Jainism therefore cuts across various faiths whilst sharing the good message of respecting & honouring our spiritual guides. 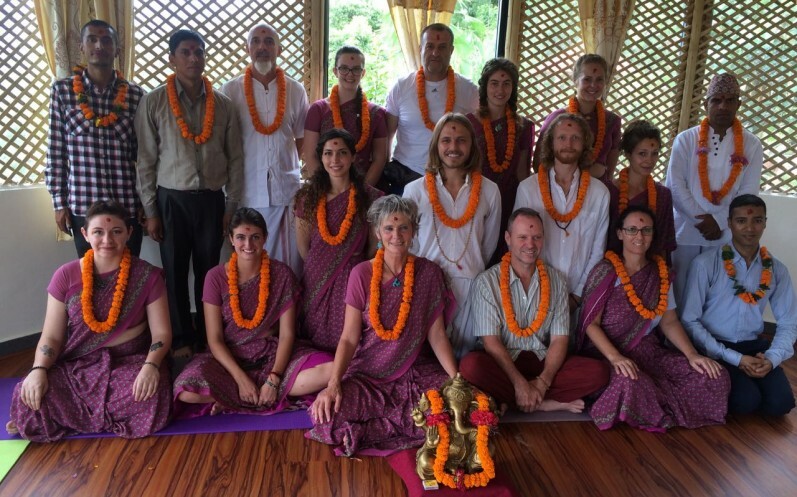 This day, we students of the Nepal Yoga Academy, dressed beautifully in traditional clothing, held a small ceremony honoring our own Gurus, Dr Chintamani and Krishna Ji. We offered gifts of a tree and a brass bell, as small tokens of our appreciation. But the day was only just beginning…. After delicious lunch, we traveled to the Ashram of the beloved, Swami Kamalnayanacharya to offer mantra and gifts to the our Guru’s Guru. 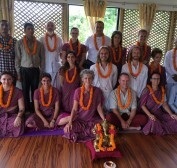 It was an auspicious and heart warming time amongst other visitors to the Swami. We sang with great enthusiasm and was thankful to be blessed by the Swami. Mr Mohan and Dr Chintamani both offered their blessings and helped to translate the story of the strong connection between these three men in the creation of the Nepal Yoga Academy. The late afternoon was dedicated to our visit to the office and online TV station of another close friend of the Nepal Yoga Academy and Dr Chintamani. We offered felicitations and chanting of the Guru Mantras to Shivananda Baba of Ananda Amrit News. 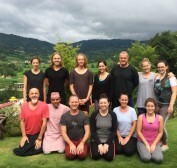 Mr Mohan, the President of the Nepal Yoga Association and yoga tourism pioneer passed his respects to Shivananda Baba and highlighted the contribution of this tradition to the betterment of society in Nepal and globally. Its important to honor our Gurus to further our own learning.